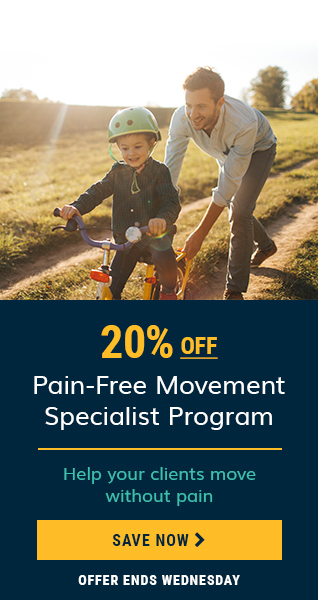 Save 20% on the Pain-Free Movement Specialist Program. Offer ends Wednesday. Starting Position: Holding two dumbbells, sit on a bench facing the backrest angled at 45 to 60 degrees. Hold your torso against the backrest and keep your feet firmly placed on the floor. Allow your arms to hang towards the floor with your elbows slightly flexed and palms facing each other. Stiffen your core and abdominal muscles (“bracing”) to stabilize your spine. Upward Phase: Exhale and slowly raise the dumbbells up and out to the sides, raising the upper arms, elbows and dumbbells in unison until the arms are near level with the shoulders. Squeeze your scapulae (shoulder blades) together as you reach the end position. In the raised position, the dumbbells should be aligned with, or slightly in front of your ears. Avoid arching your back during the upward phase by keeping your torso firmly pressed into the backrest. Downward Phase: Gently inhale and lower the dumbbells in unison back to your starting position. Technique is very important in this lift. If the dumbbells are raised to an end position behind the head rather than in line with the ears, the emphasis shifts off the shoulders and onto the latissimus dorsi (back). If my muscles are sore from previous workouts, is it safe to exercise them?